WFG600 can be ordered in 8-channel version, 2-channel version (or anything in between) with �100V outputs that correspond to our F10A amplifier as standard. Alternatively the 8-channel version can be produced with �200V outputs. It is also possible to order a 4-channel �400V model where each channel corresponds to our A800 amplifier (even 8 channels, but in a larger enclosure). Other configurations can be prepared on request. 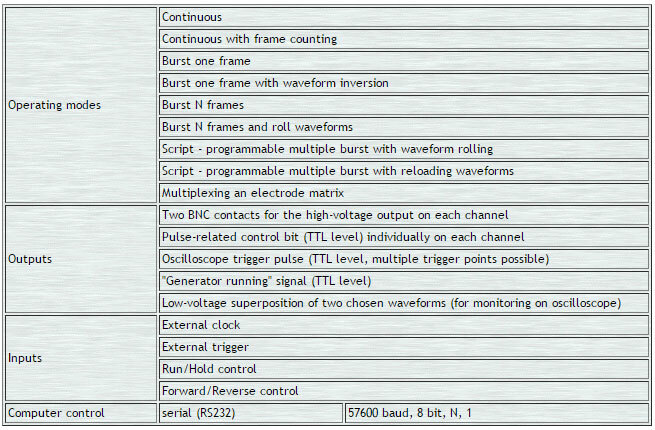 The WFG600 Waveform Generator is controlled by a PC-Windows� computer(NT, 2000, XP, Vista, 7) or a Macintosh� running OS9. A standard serial interface is used for communication. Waveforms are graphically edited on the screen. Two waveforms and their superposition are displayed simultaneously, others being accessible via pop-up menus. Functional relations between pulses in the waveforms and between time-steps can be programmed-in to avoid repeated manual adjustments. Waveforms may be joined in groups to allow synchronous amplitude adjustments. Waveform data can also be exchanged with a spreadsheet program. The WFG600 Waveform Generator is delivered with software for Windows and Macintosh environments, and with VI library for LabVIEW�. The software can be freely downloaded for evaluation. All elements of the user interface are explained on the snapshot of Macintosh screen and Windows screen.